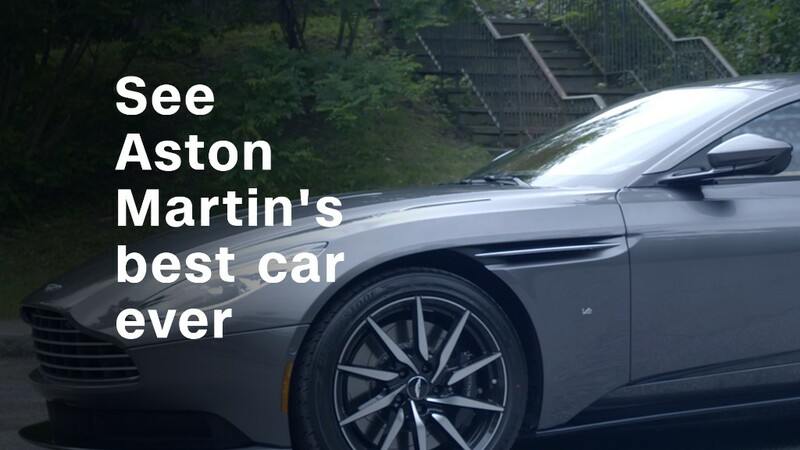 Aston Martin revealed an all-new version of its most affordable model Tuesday. Granted, we are talking about Aston Martin, so "most affordable" still means $150,000. For that price, buyers will get a 503 horsepower twin-turbocharged V8 and a top speed of 195 miles an hour. 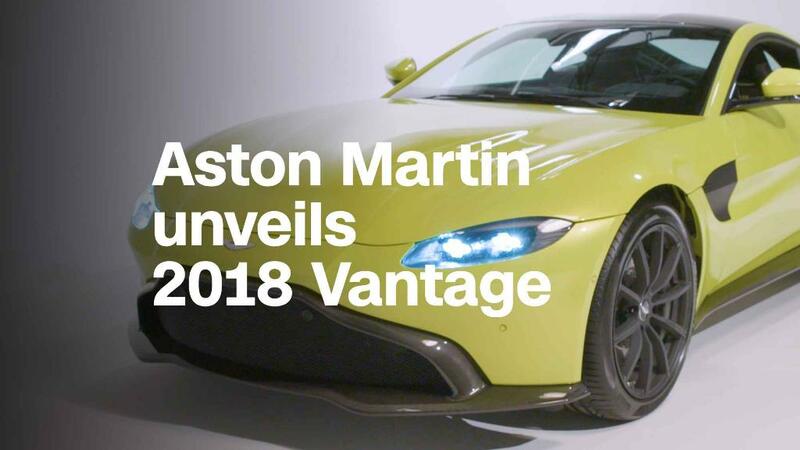 The new Vantage goes from zero to 60 miles an hour in 3.6 seconds. This year, the all-new Aston Martin DB11, a longer and more expensive grand touring car, hit the market as the first road-legal car designed entirely by the independent Aston Martin. The DB11 has garnered strong reviews from car critics and currently stands as Car & Driver magazines top-ranked "Ultra-luxury coupe," beating out models like the Ferrari California T and Bentley Continental GT. The new Vantage, intended as more of a pure sports car, looks very different from the DB11. While it retains the classic Aston Martin grill shape, the grill rides lower to the ground, making its distinctive outline harder to discern. Only a narrow wing, designed to slice the air while pinning the front of the car to the ground at high speeds, runs along its lower edge. The Vantage's side vents can be painted the same color as the body, as on this car, black. In the back, a sharply upturned tail provides more down-force while driving. Taillights form a narrow, curving strip that runs along the top edge of the up-turned tail. This is a feature that could become a signature design item on future Aston Martin cars, a spokeswoman said. Triangular "gills" behind the front wheels allow air to escape from inside the front wheel openings. Depending on the customer's preference, the vents can be black or can be painted the same color as the rest of the body. 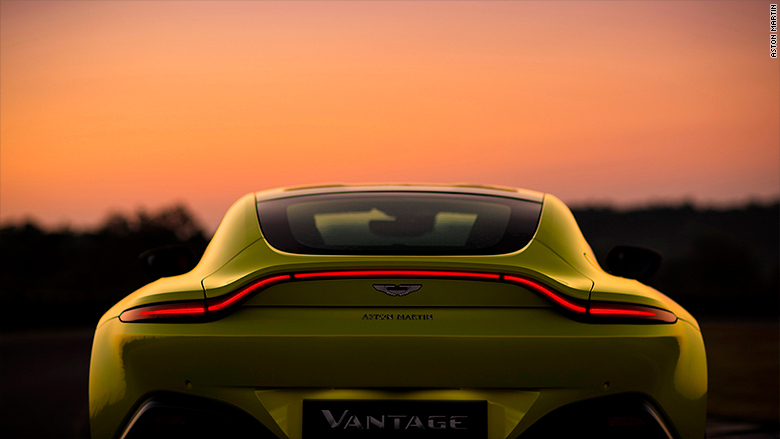 The narrow taillights wrapped around the edge of the back wing are expected to become a standard Aston Martin design feature. The car will have an eight-speed transmission and three selectable driving modes. The driver will be able to choose from Sport, Sport Plus and Track. Each makes the car's performance, and its engine sound, more aggressive. For instance, the steering and accelerator pedal become more responsive and the suspension firmer. There will be no "Touring" or "Comfort" mode in this car. The previous V8-powered version of the Vantage had a 430 horsepower engine. 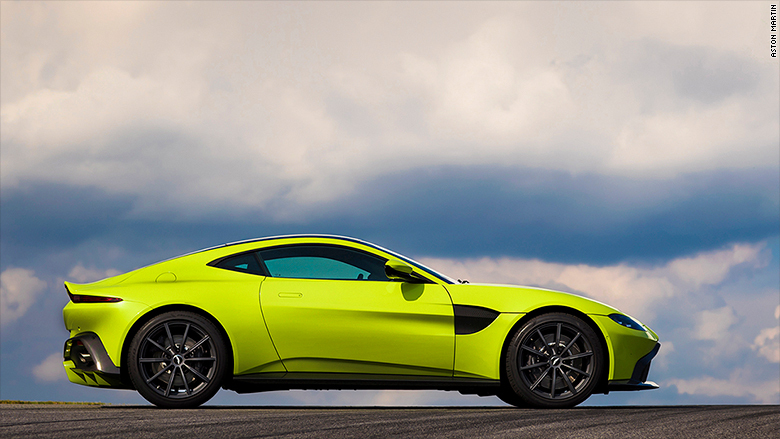 That version of the Vantage was available with a 565-horsepower V12 engine. There are no plans to offer a V12 in this new version, though, an Aston Martin spokeswoman said.